Grab some popcorn and settle down for a top-notch night in with this smart lighting bundle from Philips Hue. The package is complete with a 2 metre LightStrip, as well as a Hue Play twin pack to place on either side of the TV. You can use them to create a stunning backdrop of different hues and tones for the ultimate cinematic experience – so all that’s missing is a cold drink and some snacks. Plus, the schedule function lets you set a time for them to turn on or off, and you can even dim the brightness to set the mood too. 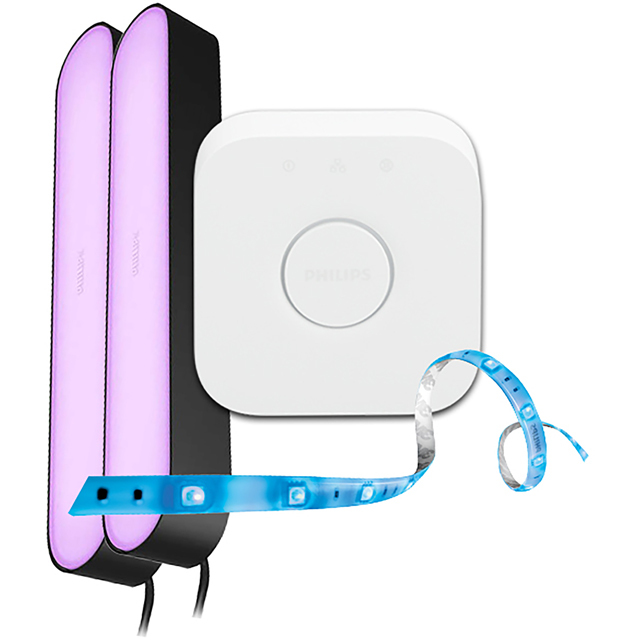 Please note, to connect the devices you’ll need to sync them wirelessly to the Hue Bridge, which is included in the bundle. Plus, you’ll need to download the Philips Hue app that works with both Apple and Android devices. Very nice set of Philips hue entertainment lights. Bridge was very easy to connect and set up. All lights have been connected in a few minutes and has been working nicely so far. 2m light strip is long enough to put behind Tv up to 43’. If you have bigger TV then 43’ then you need longer Philips hue strip light. Highly recommend.